Anka Martin poses with the new Roubion all-mountain bike in the French village that serves as its namesake. Anka Martin sprained her ankle on a descent during the first day of a three-day Juliana Bicycles media camp last week in the Southern French Alps. True to Martin's spirit she was equally, if not more, concerned about missing the final two days riding the trails of the Trans-Provence stage race with our motley crew of female journalists as the possibility of having to sit out the upcoming Enduro World Series race in Scotland. 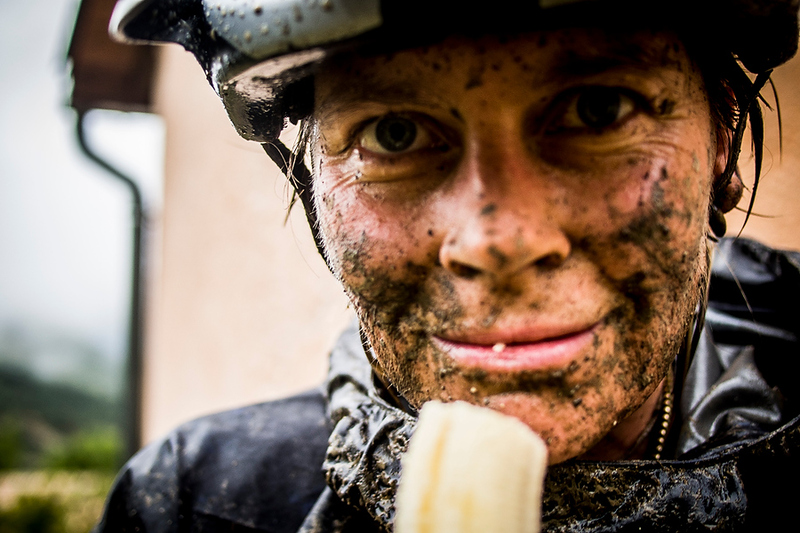 For Martin, mountain biking is about the adventure, the exploration and the camaraderie, not so much the competition, although she happens to be a badass shredder who won Trans-Provence last year and the inaugural Andes Pacifico in February, has completed the arduous Cape Epic four times and is a regular Top 10 finisher in the EWS races. Perhaps more so than those accolades, it's Martin's well-rounded, laid-back approach to the sport that makes her an ideal ambassador and racer for Juliana Bicycles, the women's-specific spin-off of Santa Cruz Bicycles. "My motto is to just ride my bike, and if I can race and get a top 10 by just riding my bike, I'm pretty stoked. I have no desire to start like VO2 max testing, using heart rate monitors and stop drinking wine and eating chocolate. I don't want to do that. That's all part of life," Martin said during an interview last week at the Les Buisses ski area, which operates the small bike park we journalists were lapping on the new Juliana Roubion 6-inch-travel trail bike. It's a bike that was inspired after Martin's Trans-Provence win, and is named after the picturesque mountainside village of the same name that marks her favorite day of the race. Anka Martin during her winning effort in last year’s Trans-Provence stage race. Juliana Bicycles is positioning itself to appeal to women who aspire to live and ride like Anka, who, between race commitments, guides backcountry bike trips in her adopted home of Nelson, New Zealand, and around Europe–the kinds of big adventures where she truly feels most inspired. Sure, Martin had her reservations at first about moving from her longtime supporter, Santa Cruz Bicycles, to be the sole sponsored pro for Juliana, but she's adapted to the role with ease, likely because she believes so strongly in the brand and the message it's promoting. She likens Juliana to Roxy, the women's surf brand of clothing that's centered more around the culture of the sport than the act of catching waves.
" [Juliana is] actually trying to create a lifestyle that women may possibly look up to and say, 'I want to go there.' It's not even the bike. They're trying to create a feeling–an emotion. They're selling something that women will see, an ad or video, they see the bike, but besides the bike they say, 'I want to go and ride there or I want to go and do that.' It's more trying to inspire women." The bikes labeled 'Juliana' are built around frames engineered and designed for Santa Cruz Bicycles and repainted and respec'd with women in mind. For Juliana, it's not about shortened toptubes or more compact geometry, but marketing a bike and an image that will attract more female riders. It's too soon to tell whether this formula will be more or less successful than others, and Martin acknowledges that the end result isn't necessarily dependent on fit or image, but how the brand is handled at retail. "If you put one model or one bike in your shop, it doesn't make an impression. You have to convince [shop owners] to get a few in there so that when women walk in they feel like 'Wow they really catered to us and I have a choice.'" 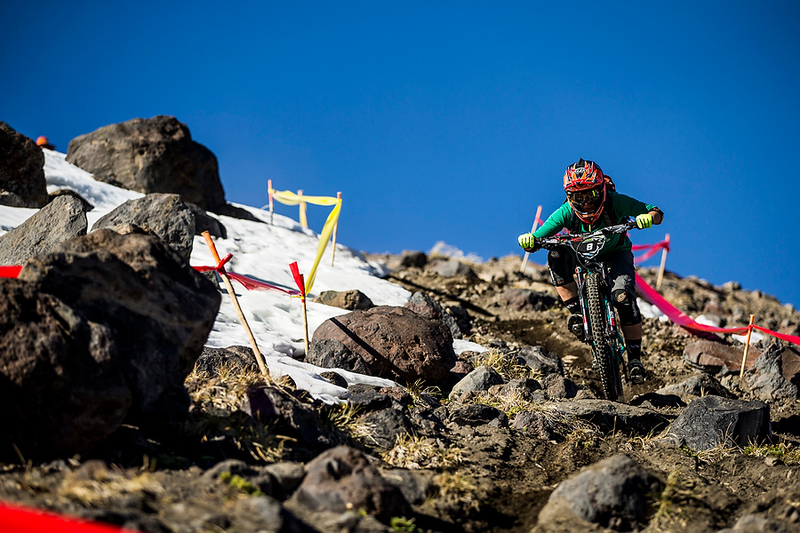 Martin took 8th place in the first Enduro World Series race this season in Chile. A career in mountain biking came relatively late for Anka, a South African native who moved to Southern California in her early 20s with her now-husband, Sven, for his professional skateboarding career, and to study fashion at FIDM Institute in Los Angeles. With Sven always off skating, she began to yearn for her own sense of identity. She bought a hardtail mountain bike to cruise the beach boardwalk in Huntington Beach, and quickly found her way to some dirt trails off the side of the paved path. That's when everything changed. "I was like 'You can ride on dirt? You don't have to stick to the boardwalk?' I met a British girl out there at the jumps, she became my bike mentor and good friend and told me about a place called Big Bear Mountain," Martin said, her voice inflecting awe as she said the name of the mountain town about two hours outside of L.A. She started going to the mountain every weekend to ride and by 25, she was racing on the NORBA circuit, traveling the country racing DH and 4X while working industry jobs to support her burgeoning race career. Sven soon joined, and later turned pro as well before transitioning full-time into mountain-bike photography. Anka rose to the sport's highest level, racing a few World Cups downhill races per year and representing South Africa in the World Championships, but eventually the intensity of jumps and stepdowns took the fun out of it. She had also grown bored of traveling to the same venues year after year, but never actually being able to ride much in these beautiful locations all over the world. She missed the adventure aspect that initially drew her to the sport, and stopped racing World Cups in 2009. At the cusp of turning 30, she craved something completely different, and signed up for her first Cape Epic. Anka didn't strive to win, necessarily, but to finish, enjoy multiple days on the bike and soak in the scenery. "I like riding my bike because of where it takes me. I love stopping and looking at the flowers and the trees and the bugs and the mountains, then riding fast. I love the nature, where a lot of people who race don't stop to appreciate it." Never afraid to get a little muddy out on the course! Along with the big races like Mega Avalanche, she sought out local enduro races when she was in Europe with the guidance of friend and mentor Jerome Clementz, one of the world's best enduro racers. Before long, the enduro race format exploded, once again providing Anka the opportunity to travel and compete around the world. This season, she plans to enter most of the Enduro World Series races–she finished 8th in the series kick-off last month in Chile–as well as compete in Mega Avalanche, the Trans-Provence and the Trans-Savoie, a six-day race from Val D'Isere to Mont Blanc along the French-Italian border. After this season, Anka, now 37, is looking ahead to the next phase of her career as a guide for Ride House Martin, the company she and Sven recently launched in Nelson, New Zealand, and as an ambassador for Juliana Bicycles. 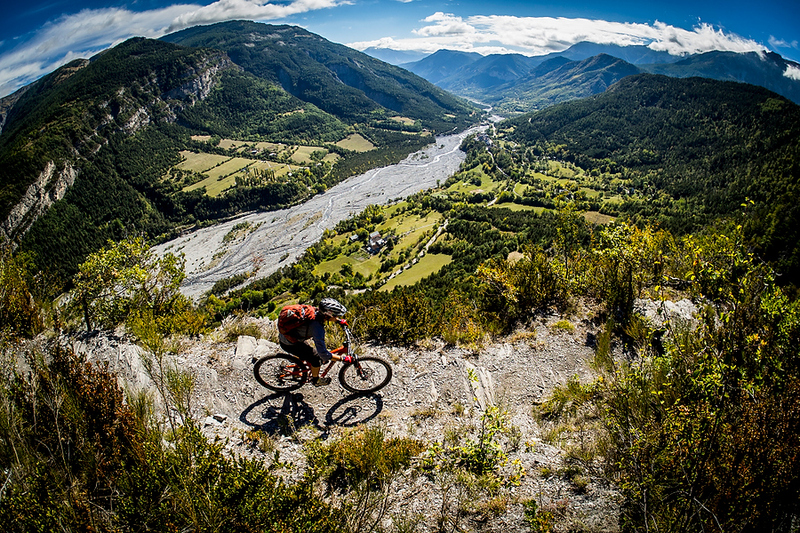 The guided trips are high-end excursions to remote trails and cater to adventurous mountain bikers who are already capable riders. They've run a few test trips and feel confident about the company's direction. And if this new chapter is anything like the rest of her career, Anka's passion and excitement will most certainly lead her down the right path. Click here for photos and videos of Anka and friends shredding her home trails in New Zealand earlier this year.